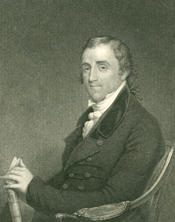 AMES, Fisher, a Representative from Massachusetts; born in Dedham, Mass., April 9, 1758; attended the town school of his native city and also received private instruction; was graduated from Harvard College in 1774; while teaching school, studied law; was admitted to the bar and commenced practice in Dedham in 1781; served in the State house of representatives in 1788; member of the Massachusetts convention called for the ratification of the Federal Constitution in 1788; elected as a Pro-Administration candidate to the First through Third Congresses and as a Federalist to the Fourth Congress (March 4, 1789-March 3, 1797); chairman, Committee on Elections (First Congress); was not a candidate for renomination in 1796; resumed the practice of law in Dedham; member of the Governors council 1798-1800; chosen president of Harvard University in 1804, but declined to accept because of failing health; died in Dedham, Mass., July 4, 1808; interment in Old First Parish Cemetery. Bernhard, Winfred E.A. Fisher Ames: Federalist and Statesman, 1758-1808. Chapel Hill: University of North Carolina Press, 1965.